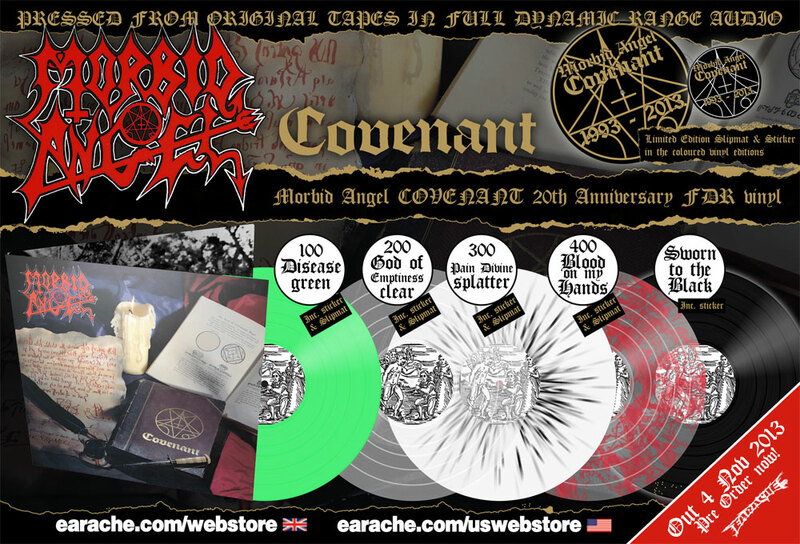 COVENANT, the classic album from Floridian death metal legends MORBID ANGEL, is due to be reissued in Europe on limited edition Full Dynamic Range vinyl LP to celebrate the 20th anniversary of the album's release. Originally released in 1993, COVENANT is the band's third album and has been specially remastered from the original tapes in Full Dynamic Range (FDR) audio, allowing the music's nuances to shine through and giving the album a more ferocious, immersive and dynamic sound than ever before. "Covenant was and still remains a very important release in our career. We are all excited to revisit this album in celebration of its 20th anniversary, both on stage and on wax. For purists and vinyl aficionados alike, this new full dynamic master pressing is sure to illuminate the analog sonic fury that we captured in 1993."